President Obama and Governor Chris Christie played a football toss game at a booth along one of the state’s iconic boardwalks. POINT PLEASANT BEACH, N.J. — There may have been no better way to demonstrate that New Jersey’s shore is rebounding from the damage caused by Hurricane Sandy than a visit from President Obama and Chris Christie, the Republican governor, and their attempts at a football toss at a booth along one of the state’s iconic boardwalks. After four throws, Obama had yet to land a fuzzy teddy bear when Christie lobbed his first ball at “Touchdown Fever” — and scored. The bipartisan high-five that followed was symbolic of the day’s effort to highlight the cooperation between state and federal governments after last year’s disaster. “That’s because he’s running for office,” Obama joked, after Christie’s football sailed through the moving tire. The jovial reunion Tuesday stood in stark contrast to the grim scene six months ago when Obama and Christie walked through the wreckage of property and lives. In a light rain Tuesday, the president and the governor worked a rope line along the boardwalk, which had been damaged by the storm. Later, at an outside event on the Asbury Park boardwalk, Obama and Christie urged Americans to flock to the repaired beaches of the state’s coastline even as they acknowledged that for many homeowners, the devastation lingers. On one level, the visit is nothing extraordinary: a president and a governor touting the success of their cooperation. Billions of state and federal dollars have aided the rebuilding of homes and businesses along New Jersey’s coast. But the Obama-Christie bromance is about so much more than that. 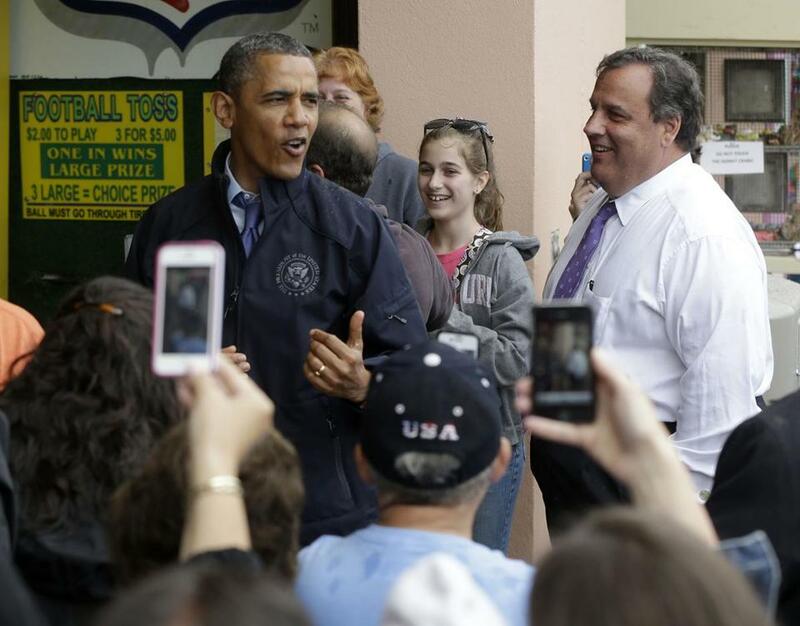 For the president, last year’s post-hurricane images of the stroll with Christie were political gold. They demonstrated the president’s willingness to be bipartisan at just the right moment. They made him look presidential. For Christie — a tough-as-nails Republican in a union-loving, Democratic state — being seen standing shoulder-to-shoulder with the Democratic president helped lift his approval ratings before his reelection campaign this year. After their appearance last fall, both men took heat from their parties. Some Republicans quietly bashed Christie for making life tougher on Mitt Romney, the president’s Republican rival in the election. And Obama’s praise of Christie has not helped Democrats in the state find a way to knock the governor off his pedestal. Freshman Representative Joseph P. Kennedy III returned late Monday from his first trip to Afghanistan, where he met with President Hamid Karzai and visited US troops. Kennedy, who traveled as part of a bipartisan group of five lawmakers, said he was impressed by the US effort to prepare Afghan forces to take over the fight by the end of 2014. “It is incredible what our troops have been able to accomplish in 10 years, after much sacrifice,” he said Tuesday. But he cautioned that a key factor determining whether those efforts are sustainable will be whether elections scheduled for next spring to replace Karzai are viewed as legitimate.